Black Diamonds and Irony: This image shows Cass's legendary Western Maryland Shay No. 6, coupled to a cut of coal hoppers alongside the former lumbering town of Spruce, West Virginia. 85 years ago, the sounds of whirring sawblades and steam exhaust echoed throughout this valley. One of workaday Shays assigned to this line was a 150 ton behemoth, the Greenbrier Cheat & Elk's No. 14. By the end of the roaring twenties, the rails at Spruce were sold to the Western Maryland Rwy and No. 14 was deemed surplus. At the height of the Great Depression, the No. 14 found its way to a new railroad, hauling coal for the WM in Maryland. 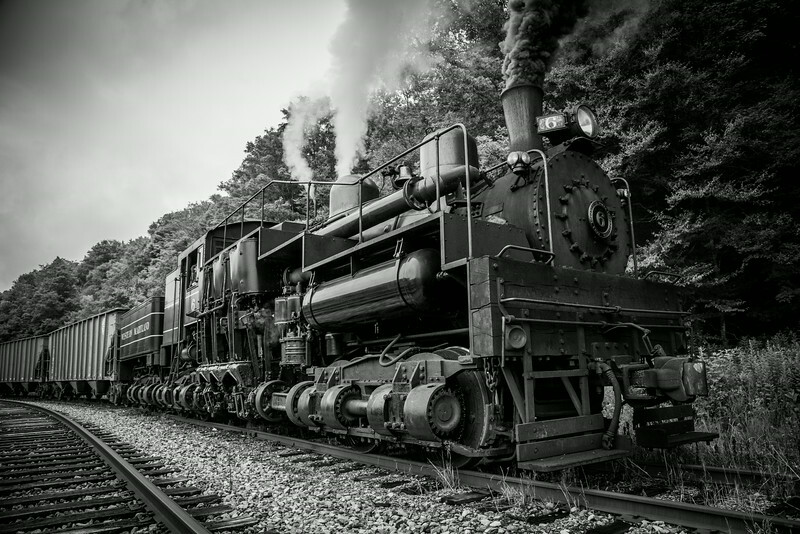 In 1942, the engine was involved in a runaway accident, placing the then renumbered Western Maryland No. 5 out of service. To keep up with wartime coal demand, Western Maryland ordered a new Shay from Lima. No. 6 arrived on property in May of 1945 and hauled coal hoppers for four short years, before retirement. Through an amazing tale of preservation, the very locomotive built to replace her wrecked sister now plies old No. 14's "home" rails on the former GC&E at Spruce. Though the mills are silent, steam still echoes through this lush valley.